As much as I love celebrating Valentine’s Day, I don’t love going out to dinner on February 14th. Similar to New Year’s Eve every restaurant seems to only offer a bagillion dollar prix fix menu filled with way too much food for my taste. Cooking for others is how I express my love. Why let someone else do it for me on Valentine's Day? This salad would be a beautiful centerpiece to a romantic Valentine’s dinner at home. Pair with a little champagne (float some of your pomegranate seeds in the glass to make it extra special) and some homemade truffles and you have the makings of a delicious, romantic, healthful evening. End the evening by making (and using!) some homemade body scrub. You can thank me later. When the beets are cool enough to handle, gently rub off the skin using a cloth. In a bowl “massage” the avocado, lemon juice, and miso into the kale until it is soft and tender. 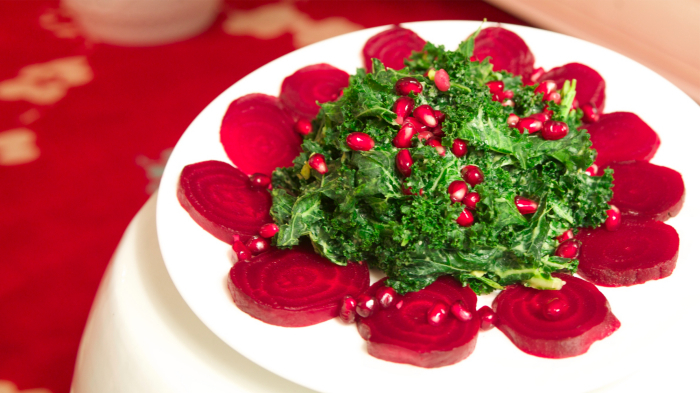 Divide the massaged kale between the center of two plates.